Do you want chic designs for your bathrooms? Southampton has a premier bathroom installation service with Stile-It. Stile-It has a growing reputation for providing bespoke bathroom fittings over the past 15 years. With our team at Stile-It, you can expect a reliable and friendly service to supply you with the bathroom of your dreams. We will work to your budget and designs to find your ideal bathroom solutions. When you want modern and innovative, Southampton bathroom designs go to Stile-It. Our team will create your ideal bathroom environment. Whether you what to renovate your bathroom, shower room, wet room, or en-suite, we can tailor your Southampton bathroom fittings to your personal tastes and preferences. Our expertise is our bespoke tiling. We install creative designs and patterns for both your floors and walls. Seamless blended tiles at great patterns can create iconic themes in your bathroom whether you are looking for spa environment or a nautical setting. Experienced workmen will install sleek designs and will carefully place each tile to ensure there are no breaks in the sealant that could damage your newly designed bathroom. Is your bathroom looking neglected? Or, do you have a leaky tap that needs fixing? At Stile-It, we can repair the plumbing and fixtures in your bathroom for higher performance results. We provide smooth refurbishments and installations of the highest calibre, so you can enjoy your new bathroom as soon as possible. 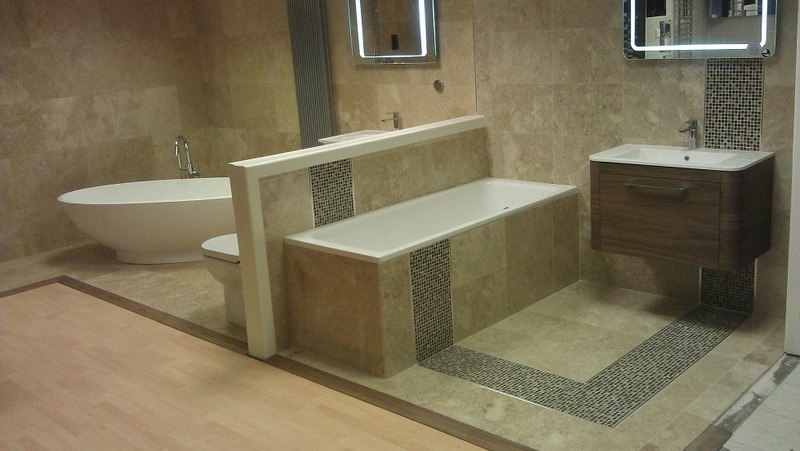 A wet room is an ideal facility if you desire a more accessible bathroom design. All of the facilities are installed on one floor, so you don’t have to worry about stepping over any difficult obstacles in your bathroom environment. Feel safe in the knowledge that our wet rooms are designed with your wellbeing in mind. Those who have previously found using bathroom amenities difficult will benefit from the added accessories of handrails, ramps, and non-slip flooring that comes with our wet room designs. We will help advise you on your ideal bathroom fitting, from design and layout to completion. Transform your bathroom into a luxurious spa-like environment with Stile-It. We consider your specifications and will install your bathroom with your family requirements in mind. With our quality products and furnishings, you can completely renovate your Southampton bathroom to the style you desire. Take a look at our gallery for some bathroom inspirations. Turn your bathroom in Southampton into a shower room with Stile-It’s professional team of plumbers and architects. We can add a shower to your bathroom, for an efficient bathroom experience. For those of you on the move, our shower rooms are the perfect amenity if you need a quick bathroom experience. Shower in style as our team have the practical experience at fitting customised shower rooms for individual needs and preferences. When you choose Stile-It to fix up your en-suite you will receive an exemplary bathroom design all to yourself. Add the luxury of an en-suite to a room on your property for the extra privacy you desire. Our friendly team at Stile-It will design and install an en-suite, for an opulent bathroom experience. No more will you have to fight over the same shower, with our en-suite installations you can enjoy the relaxing bathroom experience you deserve. Why choose Stile-It for your bathrooms in Southampton? Contact us on 02380 633966 to get your free design and quotations for bathrooms in Southampton. Or, why not send an email to info@stile-it.co.uk.